Thousands of Native Americans from hundreds of tribes gathered on the Standing Rock Sioux reservation in North Dakota, in a show of unity unseen since the heyday of Native American activism in early 1970s. Their fight, described by supporters as symbolic and momentous, aims to drive away the “black snake”—the Dakota Access Pipeline—from land the tribe claims as its own. Meanwhile, pipeline supporters have described the 8-month protest as overblown and politicized, and said the protesters are clinging to claims unsupported by the law and using historical injustices to hinder common-sense practicalities of today. The 1,172-mile pipeline spans four states and, at one point, comes within half a mile of the reservation, where it’s slated to tunnel under Lake Oahe, a dammed part of the Missouri River and a sacred site to the tribe. At least once, the protests have led to a violent clash with construction site security, in which both the protesters and security personnel were injured. Since then, on multiple occasions, local law enforcement has pushed the protesters away, sometimes using tear gas, pepper spray, and water cannons—a much-maligned tool in the North Dakota chill. The protests attracted thousands of supporters, including at least 200 other tribes, environmental activists, veterans, and clergy, who visited the protest encampments by the confluence of the Cannonball River and Lake Oahe. National media settled in the camps, producing extensive coverage. On Dec. 4, the Army Corps of Engineers denied the permit to drill under the river, saying it needs to consider alternative routes and perhaps a more extensive environmental study. 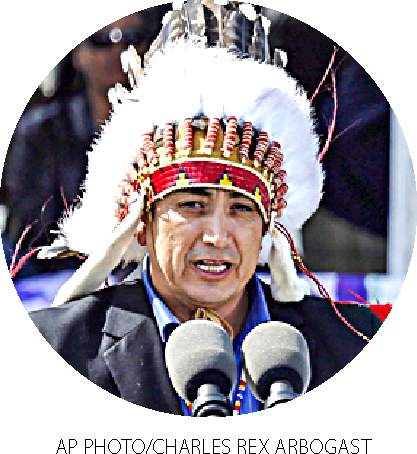 The tribe rejoiced, and its chairman, Dave Archambault II, called off the protest for the time being. Some protesters have stayed, fearing the company would start drilling even without the permit if they left. The future of the pipeline hangs in the balance. Although the Obama administration recently halted the construction, what happens next will be a matter for the next administration to decide. 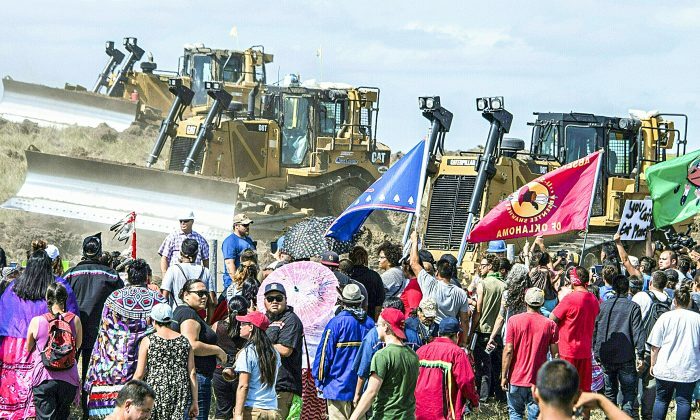 The Standing Rock Sioux Tribe has opposed the pipeline since the project was announced two years ago. The tribe fears the construction and possible oil leaks will destroy its sacred sites and pollute its land and water. But it struggles to find legal means to block the pipeline, which traverses private land along the reservation border. Some of the private land falls into territory left to the tribe by a 1851 treaty with the U.S. government. That land was taken away by a congressional act in 1877—a step the tribe has never recognized and has fought in court. Ultimately, the Supreme Court sided with the government in 1980, but granted the tribe compensation. The tribe refused to accept the money, which is still collecting interest in a trust to the tune of more than $1.2 billion. History connects the dots of our identity, and our identity was all but obliterated. 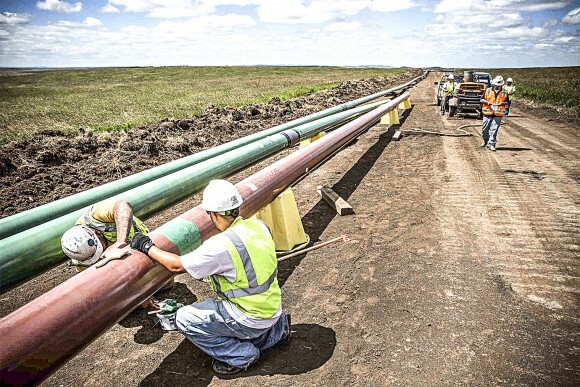 As the drilling under Lake Oahe requires a federal permit, the tribe has sought to use its say in the permitting process to have the pipeline moved. When their attempt failed in July, the tribe launched a lawsuit. In September, federal Judge James Boasberg decided not to grant an injunction, thus allowing the construction to continue during the lawsuit. Meanwhile, the tribe tried to block the construction physically. The tribe considers the pipeline yet another injustice in a long line trailing back hundreds of years. The government has repeatedly encroached upon the tribe’s land. In the 1950s and ’60s, the Missouri River was dammed against the tribe’s wishes, displacing hundreds and flooding sacred sites. 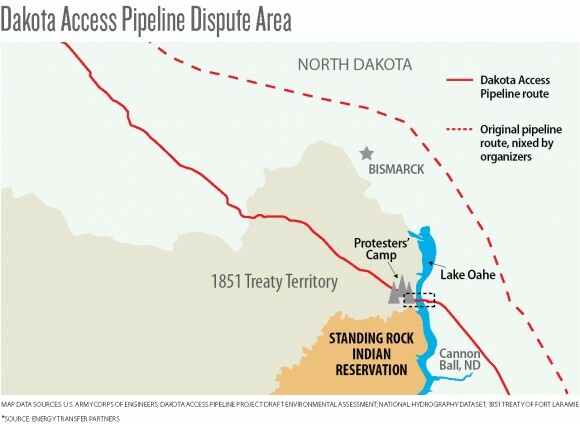 A natural gas pipeline was drilled under Lake Oahe against the tribe’s wishes and has now been used to justify building the Dakota Access right next to it. The tribe hasn’t responded to a request for comment. The pipeline builder, Energy Transfer Partners, sees itself going above and beyond what laws and regulations require and considers further hindrance to the project to be political. It is building the pipeline to move North Dakota oil to refineries in the Midwest and the Gulf Coast. Thanks to fracking, the state has tripled oil production over the past six years. Due to the lack of pipeline capacity, the oil ends up being transported by truck or train, methods less safe and considered less environmentally friendly than a pipeline. 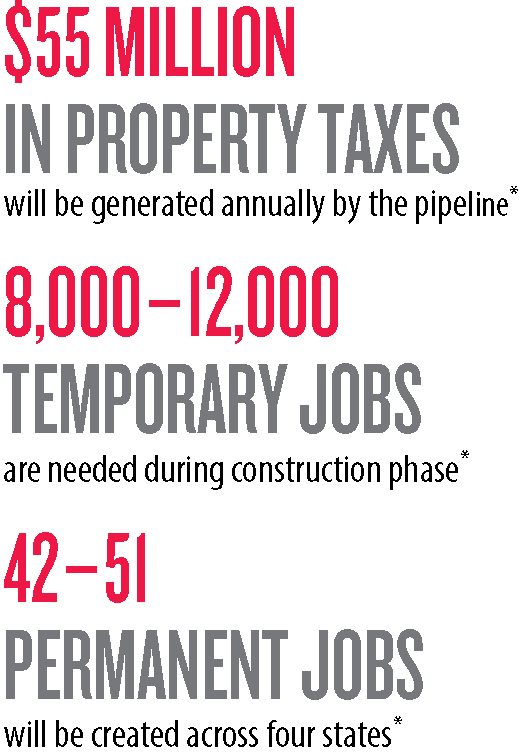 According to the company, pipeline construction has created thousands of jobs and over $150 million in income and sales taxes. Once finished, it will contribute nearly $55 million in property taxes a year. Energy Transfer Partners has tried to plan the pipeline route to avoid residential areas, water sources, and cultural sites. It also tried to follow existing pipelines and transmission lines to avoid breaking undisturbed land. Various groups, including Native American tribes, have alerted the company to important sites that the company then avoided through 140 course revisions. In 2014, the company asked the Standing Rock tribe’s historic preservation officer Waste’ Win Young to point out any cultural sites that may be damaged by the construction and also sent her its own cultural survey for review. Young didn’t respond, according to court documents. To avoid disturbing Lake Oahe, the company planned to drill the pipe more than 90 feet below the lakebed and install valves on both sides that can close it in case of a leak. The pipeline has multiple safety features, including nonstop pressure-monitoring to detect leaks. The company hasn’t responded to a request for comment. Laws and regulations side largely with the company, Energy Transfer Partners. The government doesn’t recognize the tribe’s claim over the land taken away by the 1877 congressional act. It also judges crossing under Lake Oahe to pose only minor and acceptable risks. Since the nation’s oil dependency will hardly abate, the government acknowledges that pipelines, though not completely safe, are needed. The tribe sees the current laws and regulations as insufficient to protect its environment and heritage. The Obama administration sided with the tribe, saying regulations may need to change to give Native Americans a bigger role in the permit-granting process. There are over 73,000 miles of crude oil pipeline in the country. They leaked 258 times last year, spilling roughly 21,000 barrels, according to the Pipeline and Hazardous Materials Safety Administration. Some two-thirds of the leaks are small—about five barrels on average. The rest average close to 260 barrels each. Some small leaks don’t get reported if they don’t spread into the environment, like those on oil wells properties. The blame for accidents lies partly with aging infrastructure—about half of the pipelines are 50 years old, or older. New pipelines are also held to higher safety standards than what was required a few decades ago. The Army Corps’ environmental assessment estimated that Lake Oahe would be able to absorb a leak of up to 30 barrels (about 1,200 gallons) without breaching safety limits for drinking water. Energy Transfer Partners considered an alternative route some 30 miles north that would have kept it at least 10 miles from the reservation and even avoided its broader borders under the 1851 treaty. Yet the route was nixed. The environmental assessment states multiple reasons: The route would have been 11 miles longer and $22 million more expensive; it would have crossed more waterways, wetlands, and roads; and it would have come close to water well heads and residential areas surrounding the state’s capital, Bismarck, which has a metropolitan area population of some 130,000. The reservation hosts a population of about 8,250, with less than 900 living near the planned pipeline crossing. The tribe argued that a leak in the pipeline would endanger its drinking water intake, which is situated in Fort Yates, about 20 miles downstream from where the pipeline would cross the river. But that intake is slated to move in the coming months another 50 miles downstream to Mobridge, where the tribe has a new water treatment plant. Federal government gave the tribe nearly $30 million in grants in recent years to rebuild its water infrastructure. The tribe says the new plant is still not safe enough from possible leaks, and even if it was, a leak could still pollute Lake Oahe—an unacceptable occurrence for the tribe. President-elect Donald Trump supports the pipeline—it fits his goal of boosting domestic oil production and making America energy independent. He said he’ll look into the Standing Rock situation after taking office. He will be able to reverse the current Army Corps decision and greenlight the drilling under Lake Oahe. But this is just one among many issues Trump has promised to address, and it remains to be seen how much priority he will give it. Meanwhile, the environmental impact statement the Army Corps called for may take months, or even years, to complete. This would cost Energy Transfer Partners hundreds of millions in lost revenues, since it promised clients it would have the pipeline ready by January 2017.